La desventaja inevitable que tiene un movimiento sin sede central es la falta de un representante para manejar el activismo y dirigir el entusiasmo en actividades eficaces contra la pseudociencia, mientras que los grupos locales concentran sus energías en las actividades locales. Yo era extremadamente crédula e ingenua. No tenía a quién preguntarle y la Guerra Fría estaba en su esplendor. Every physical anthropologist secretly wishes that Yeti and Bigfoot were real. It changed my life. I had already rejected religion after reading atheist writings, but I was still open to belief in UFOs, ESP, and all sorts of other weird things, simply because I had never come across anyone who questioned those beliefs. Back in the early 1980s, I believed in quite a number of paranormal claims. In my defense, back then skeptical critiques of parapsychology were even rarer than they are now, and all the books I used in preparing the lecture were uncritically pro-paranormal. This goes to the heart of what, for me, skepticism is about: things we can test. I have yet to have a person name an occupation or hobby that doesn’t have some angle into pseudoscience or paranormal claims. I was extremely gullible and naive, had no one to ask, and the Cold War was in full swing. When I was twelve years old, UFOs were real. The inevitable downside to a movement with no center is a lack of a figurehead to drive activism and direct enthusiasm into effective pursuits, meaning opportunities to counter pseudoscience directly and publicly sometimes pass by, with local groups focusing their energies on their own local activities. I analyzed the Perrons’ claims of demonic activity and showed that they were consistent with the effects of strong winds, misperceptions, schoolgirl pranks, vivid dreams, simple suggestion, role-playing, and other factors. Hint: Focus on Community-Based Strategies and Avoid Denigrating Parents. 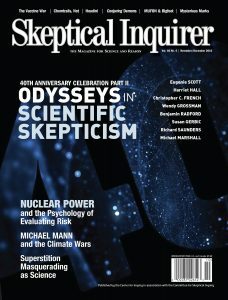 Physicist and CSI Fellow Mark Boslough interviewed noted climatologist and geophysicist Michael Mann, who spoke at CSICon Las Vegas. From Tiny Acorns . . .